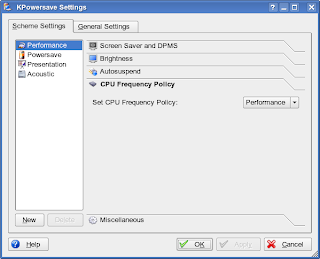 Currently I work on the next KPowersave version 0.7.2. The most work is already done and the new configure GUI get finished for this version. Here two screenshots of the new dialog. The second show the new 'General Settings' section which now include the already in 0.7.1 via the config file changeable options: battery levels and actions, button events and the default AC/battery scheme (click on the picture to show the animated gif and all new tabs). I plan to release the new package (including many bugfixes) within the next days. A complete translation is currently only available in german. Feel free to checkout the translation files from here, to translate to your language and to send me the updated file. Any help would be really appreciated. One of problems with Tablet PCs under Linux is lacking support for small, but very essential features as the Windows XP Tablet PC Edition provide. There are already drivers for machines with e.g. Wacom tablets or some Fujitsu Siemens (FSC) devices and also some applications as Xournal, Jarnal or xstroke which provide useful features. On SUSE there is also support in SAX to configure Wacom and FSC devices and I already wrote a patch for HAL (v0.5.8/git) to detect Tablet PCs and set the needed Ports correct and automatically. There is also a patch for XDM to show xvkbd on login and a patch for KDE to show xvkbd on the unlock dialog from Lubos Lunak. But until now one feature was missing: The user could rotate the screen via KRandr and also the Wacom driver support already rotation but there was no way to do this together because the Wacom driver did not support the XRandR extension. The user had to call xsetwacom to rotate also the input devices to use rotation. Thanks to Stephan Binner the user can now rotate the screen and the input devices together via KRandr and it work like a charm. You can find the patch here. Some time since I posted the last blog entry. So now the first message of the new year. These patches are against current HAL git. As always: you can find all my current HAL patches here.